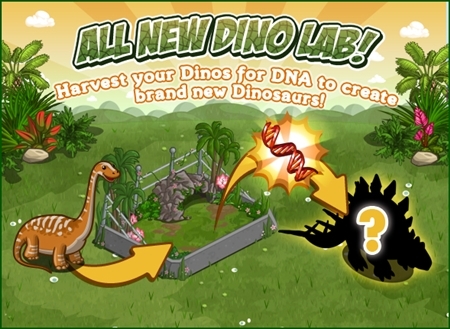 FarmVille has just released the new Dino Lab Breeding Station. Now you can raise and breed this prehistoric animal in your farm. Just gather the materials and parts needed to built this new structure. Once you enter the game a Popup message will notify you about this new feature. Then you’ll be in a placement mode to let you place the Dino Lab. In case you missed it you can find it n your Gift Box or you can buy one from the Market. got the dino-pen, but do i have to buy the dinos for FV-money? i dont see any other way to get it. 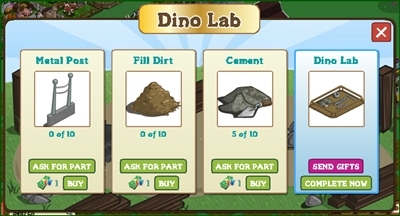 Hi…I am not received dino lab…i checked my giftbox and market there is no dino lab…how can i get that. I used the search button too nothing! Customer service says not everyone has access yet. Again I’m stuck without something. i had to go to the support email to get my dino lab but now that i have it, i put 10 items in than it says that there has been error. this has happened on all 3 parts. screen refreshes and stuff is back in gift box. Maybe you already placed one in your farm. It only allows to build one, and once place you can’t anymore build in other farm. If you sure you don’t have one yet and it still locked you should try to file a ticket at Zynga support.